Upasana, P.B.No. 2913, Dharmaram College Post, Bangalore – 560 029, Karnataka, India. 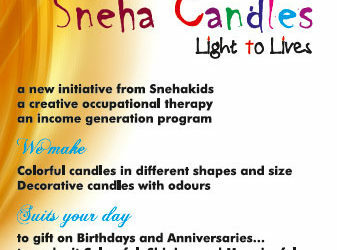 Sneha Charitable Trust is registered as a Public Charitable Trust on 30/01/2003 vide its Registration No. BNG(U)-JNR 506/2002-2003. It was granted FCRA approval on 08/07/2003 vide its Registration No. 094421042. The Trust is engaged in various activities, such as carrying out social welfare activities for the relief of the poor, needy and sick people; construction and management of healthcare charitable institutions; awareness, treatment and rehabilitation of HIV-infected adults/children and destitute; education of orphan and vulnerable children; organizing healthcare related trainings, seminars and camps; blood donation movements; counseling services etc. The following is the summary data of Opening and Closing Balances, Receipts and Utilisation of the foreign contributions pertaining to the financial year 2011-2012 (01/04/2011 to 31/03/2012); published, pursuant to Rule 13 of the Foreign Contribution (Regulation) Rules, 2011 read with the provisions of the Foreign Contribution (Regulation) Act, 2010. 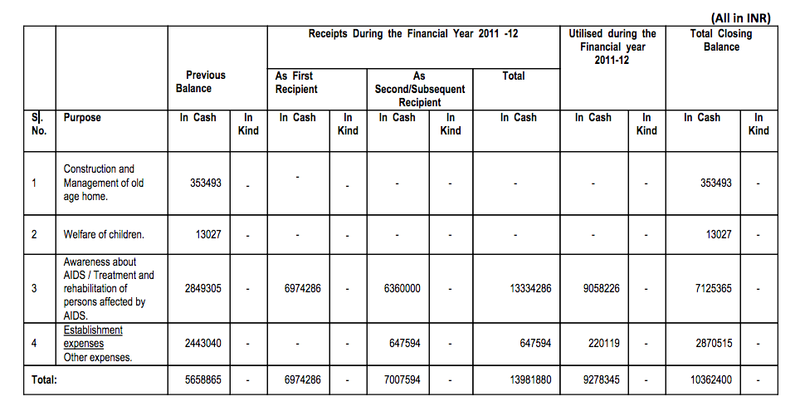 It consists of receipts and utilisation of foreign contribution received by the Trust.